The Landing School effectively prepares men and women for careers in the marine industry as practical designers, builders and systems technicians who work professionally on today's vessels, adapt to the industry's evolving technology and appreciate the traditions of the past while imagining and building the boats of the future. The boats students build vary from year to year to ensure students build a boat or boats that match the student cohort and interest, and the skills needed in the industry. Typically, students might expect to develop their fundamental boat building skills by building a small skiff in the fall semester, and then go on to further develop those skills by building a more complex mid-sized powerboat or sailboat in the spring semester. 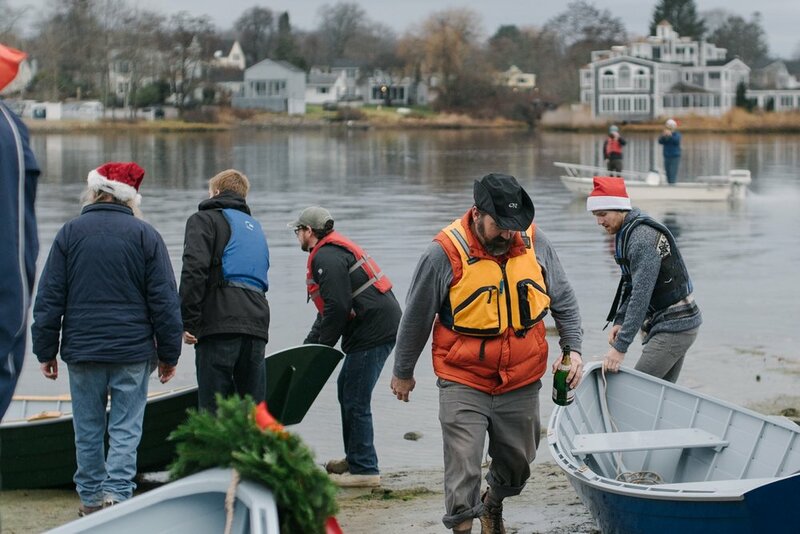 You will work in boat-specific groups and develop the skills, techniques, and artistry that comprise wooden boat building while becoming a high performing individual and team member. The Composite Boat Building program is a highly structured curriculum that prepares individuals for the real world demands of manufacturing composite material and products for the marine industry. The program divides the academic year into two specialized semesters, each focusing on the fundamental components of the planning and production of composite based marine industry products. Students in the composite boat building program study the strength, stiffness, structural mechanics and finish of many different composite materials such as fiberglass, carbon, aramids, gel coats and coatings. They are given instruction in the fabrication of these materials, from hand layup to vacuum infusion and pre-preg construction in both open and closed-molding environments. Students also build the plugs and molds needed for the production process. Although inclusive of a variety of composite materials, the program emphasizes the use of polystyrene in order to equip students with the most applicable skill set for the marine industry workforce. Professionals in Marine Systems keep every kind of seafaring vessel running, from an outboard powered skiff to a nuclear submarine. As such, students in The Landing School Marine Systems Program cover a broad range of topics in their studies, from gasoline, diesel, and electric propulsion systems to high resolution electronics. 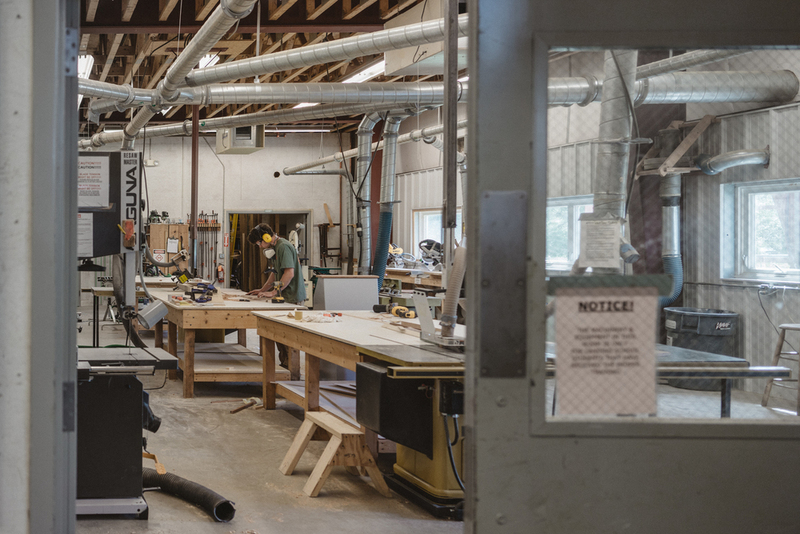 In the Spring semester, work on project boats allows students the opportunity to practice the skills they develop in the fall while working on shop projects. By the time you finish your studies at The Landing School you will be prepared to enter the workforce ready on day one to work on common marine systems and well prepared for a career of lifelong learning. 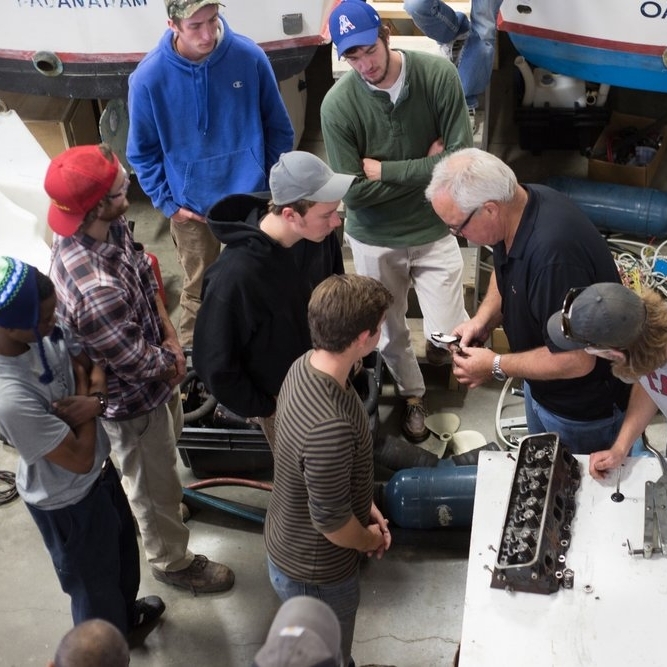 The Marine Systems Program at The Landing School offers more areas of study than any of our other programs, teaching you principles used worldwide to keep everything from skiffs to submarines running. Upon graduation, you will be prepared to work on the most complex marine systems as a valued technician or marine engineer – wherever water vehicles or machinery are needed. Yacht Design is all about creating a dynamic, artful watercraft with nothing more than your imagination, technical skills, and a computer. The design, shape and materials defined by the designer and used in the construction of a boat can make it more energy efficient, cost effective and aesthetically pleasing. In The Landing School Yacht Design Program, you’ll obtain the knowledge and skills that will enable you to craft some of the finest boats in the world. As a student in the Yacht Design Program at The Landing School, you will learn to combine design, shape and materials in order to create boats that are more efficient, cost effective and aesthetically pleasing. Our graduates gain skills that allow them to excel in a variety of pursuits – from designing an America’s Cup yacht to working as a naval engineer, or even running their own yacht building company. After completing the program, you will have a portfolio you can use to demonstrate your skills and experience to potential employers.